Come be a part of the exciting progress taking place in the heart of the City Zirakpur! Planting roots near the happening VIP Road, Chadigarh Citi Center is expanding business and providing retail opportunities with an upcoming shopping complex. This brand new commercial center will be a one-stop shop for the more than fifty thousand Zirakpur citizens who live in the high-rise apartment complexes nearby. City center developers want Chandigarh Citi Center to be the first name in retail when people are looking for entertainment, luxe boutiques, and stellar services. Chandigarh Citi Center will encompass 10 acres of effectively designed and well-manicured land, giving shoppers, nearby residents, and business owners the benefit of sharing in a setting that is both beautiful and bountiful! Positioned strategically next to India NH 22, the “Delhi-Chandigarh” National Highway, the Chandigarh Citi Center will carry on the expansion of Zirakpur by joining the multinational corporations, star hotels, major Indian brands that have already set down roots here. Planned to be the biggest retail market near VIP Road, savvy business owners will be able to provide Zirakpur residents with their stellar services, quality products, and lush accommodations by taking part in the Chandigarh Citi Center opportunity now. Especially, since the locale of this new commercial center will be about 5 meters away from the prospective Chandigarh International Airfield. That would mean expanding the brands investing in the Chandigarh Citi Center far beyond the city limits of Zirakpur! Featured in the heart of Zirakpur, Chandigarh Citi Center is an opportunity for business owners, investors, and entrepreneurs of every stripe. The commercial hub aims to be the biggest retail market in Zirakpur, and will provide opportunities for expansion by including business offices, boutiques, service outlets, spas, SoHo studios, clinics, even bakeries, Retail Shops,Showrooms and a cineplex! 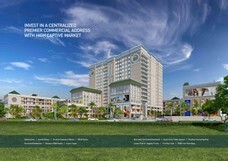 Supported by effective planning, optimal design, and ecological considerations, CCC will be a Zirakpur shoppers’ haven!